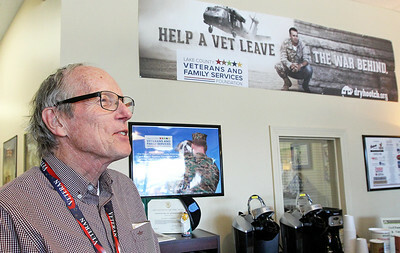 Candace H. Johnson-For Shaw Media Bob Gorman, veteran peer specialist, talks with Daniel Sheline, volunteer and Navy veteran, at the Lake County Veterans & Family Services Foundation's Dryhootch Drop-in Center in Grayslake. 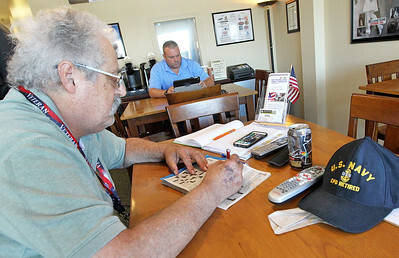 Candace H. Johnson-For Shaw Media Bob Gorman, veteran peer specialist, talks with Nick Jones, of Waukegan, an Army veteran, at the Lake County Veterans & Family Services Foundation’s Dryhootch Drop-In Center in Grayslake. 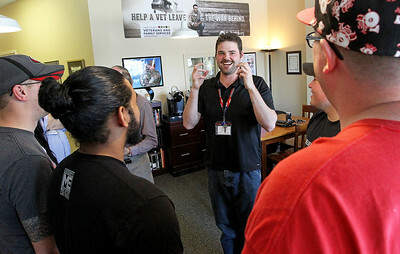 Candace H. Johnson-For Shaw Media Michael Hughes, of Wildwood, veteran peer specialist and Marine veteran, talks with other veterans at the Lake County Veterans & Family Services Foundation’s Dryhootch Drop-In Center in Grayslake. 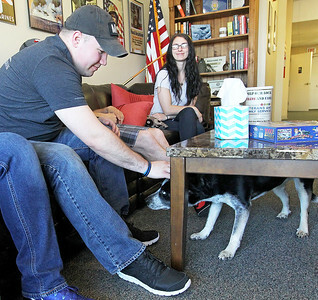 Candace H. Johnson-For Shaw Media Michael Hughes, of Wildwood, veteran peer specialist, sits with his service dog, Xena, as he talks with other veterans at the Lake County Veterans & Family Services Foundation's Dryhootch Drop-In Center in Grayslake. Hughes is a Marine veteran who served in both Iraq and Afghanistan. 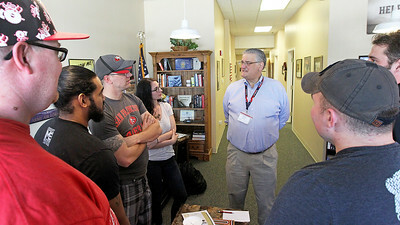 Candace H. Johnson-For Shaw Media Paul Baffico, founder and president, talks with student veterans from the College of Lake County at the Lake County Veterans & Family Services Foundation’s Dryhootch Drop-In Center in Grayslake. Baffico is an army veteran who served during the Vietnam War. 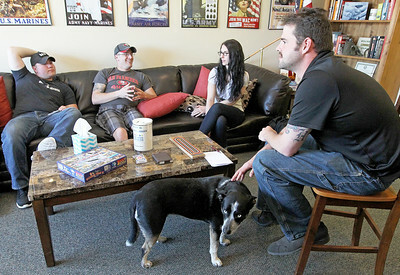 Candace H. Johnson-For Shaw Media Matteo Lopez, of Waukegan, Justin Culliton, of Burlington, Wis., and Jessica Lopez, of Waukegan, student veterans from the College of Lake County, talk about planning a Ruck March in September as Michael Hughes, of Wildwood, a veteran peer specialist, sits close by with his service dog, Xena, at the Lake County Veterans & Family Services Foundation's Dryhootch Drop-In Center in Grayslake. Candace H. Johnson-For Shaw Media Matteo Lopez sits near Jessica Lopez, both of Waukegan, as he pets Xena, an Australian Shepherd-mix service dog, at the Lake County Veterans & Family Services Foundation’s Dryhootch Drop-In Center in Grayslake. 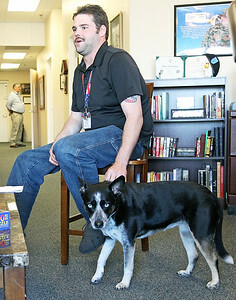 Xena's owner, Michael Hughes, is a veteran peer specialist at the center. 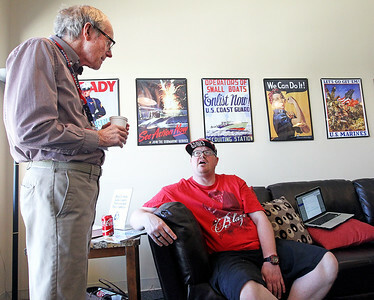 Candace H. Johnson-For Shaw Media Volunteers Carl Marro, of Gurnee, "The Chief," and Daniel Sheline, both Navy veterans, pass the time as they wait to welcome visitors at the Lake County Veterans & Family Services Foundation’s Dryhootch Drop-In Center in Grayslake. Candace H. Johnson-For Shaw Media Bob Gorman, of Barrington, veteran peer specialist, talks about what Dryhootch stands for: dry meaning sober, and hootch meaning any place that you sleep, at the Lake County Veterans & Family Services Foundation's Dryhootch drop-in center in Grayslake. 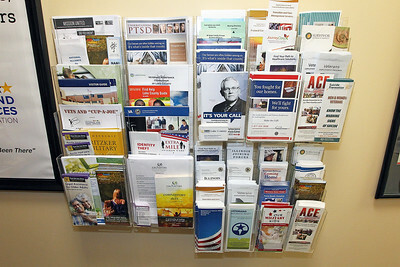 Candace H. Johnson-For Shaw Media Resource guides for veterans and their families are available at the Lake County Veterans & Family Services Foundation’s Dryhootch Drop-In Center in Grayslake. 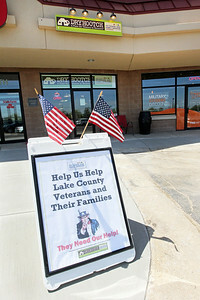 Candace H. Johnson-For Shaw Media The Lake County Veterans & Family Services Foundation's Dryhootch Drop-In Center at 100 South Atkinson in Grayslake. Volunteers Carl Marro, of Gurnee, "The Chief," and Daniel Sheline, both Navy veterans, pass the time as they wait to welcome visitors at the Lake County Veterans & Family Services Foundation’s Dryhootch Drop-In Center in Grayslake.